William Schofield presents a classic analysis of mental illness, of professional psychotherapists and their training, and of the elements of psychotherapy. He asserts the need for more rigorous selection of candidates for therapy and for a properly focused training of a new professional specialist: the psychotherapist. In his new introduction to this important critique, Schofield shows why his pleas for a rational training program are still appropriate. Psychotherapy is a pioneering critique of modern psychiatric practices. Far too many people see psychotherapy as a cure for every ill from tormenting self-doubt to lack of zest of life. Through failure to attend to careful assessment of the presenting problem, and the nature (and neglect) of the applicant's social resources, the psychotherapist can fall unwittingly into the role of moral counselor or morale coach, and can be seduced into the chronic role of "best friend." 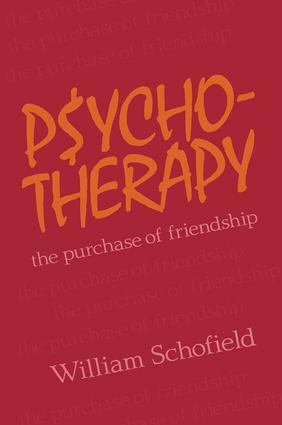 Schofield argues that today's overburdened experts�psychiatrists, clinical psychologists, and psychiatric social workers�are not specifically trained to administer therapy through conversation. This book, first published in 1964, is an urgent call for a new specialist, a psychotherapist trained as a specialist in therapeutic conversation. This book is also a call for a more realistic public attitude toward mental disorder�one which distinguishes emotional illness from unhappiness and discontent. Everyone interested in the growth, clarification, and evaluation of psychotherapy and counseling will be challenged by Schofield's arguments.